Citation: Abulezz R, Alhamdan H, Khan MA. Use of a strategic plan for the clinical pharmacy section in a tertiary care center. J Basic Clin Pharma 9(3):289-293. PURPOSE: To develop and implement a strategic plan with higher standards for the clinical pharmacy section (CPS), which would positively reflect on patient care, while maximizing future successes. METHODS: In 2011 a strategic plan was adapted from 2007 American College of Clinical Pharmacy strategic plan with modifications. The mission of CPS is to advance human health and quality of life by extending the frontiers of clinical pharmacy. The vision was the CPS will drive positive changes in quality patient care through advancing pharmacotherapy to achieve optimal medication therapy in the prevention and treatment of disease. The plan outcomes were; establishing clinical pharmacy services as an essential component of patient care in all practice settings, advances in clinical pharmacy and pharmacotherapy through engagement in research, advance clinical pharmacy and pharmacotherapy through training and education, develop successful models of practice, disseminates up-to-date knowledge to advance pharmacotherapy and patient care, maximize the efforts to achieve advocacy from other departments and higher administration, and work with pharmaceutical care administration to maximize patient care and improve pharmacy profession. These outcomes were subcategorized into several strategies which were also subcategorized into measurable objectives. The timeline to achieve these outcomes was five years. RESULTS: Within two years since developing the strategic plan, we achieved 44%, 100%, 67%, 100%, 78%, and 71% of the objectives for the first, second, third, fourth, fifth, and sixth outcome, respectively. Targeted goals of 37% and 39% of the objectives were met and exceeded, respectively. We did not achieve the targeted goal for 12% of the objectives while we partially achieved the targeted goal of 12% of the objectives. CONCLUSION: The CPS successfully achieved most of the objectives of the strategic plan outcomes. Adopting a strategic plan with higher standards has led to significant improvements in the clinical pharmacy services. The core management process conducted by health-care organizations and pharmacies is strategic plan and the success of any organization essentially depends on strategic planning . In 1986, four studies that focused on strategic planning for clinical pharmacy services were published, but they represented general experiences for the pharmacy services as a whole [2-5]. During that time, there was a shift in focus from medication to patient care. In 1990, Guerrero and colleagues published an article that provided a guide for pharmacy managers, which emphasized a methodological approach to strategic planning as well as obtaining resources to develop, implement, and operate clinical services . None of these articles provided a specific, detailed strategic plan (with clear outcomes) for the clinical pharmacy section. In 2007, the American College of Clinical Pharmacy (ACCP) Board of Regents, Research Institute Board of Trustees, and Pharmacotherapy Board of Directors created a detailed strategic plan for the ACCP. They identified an excellent plan with clear outcomes, goals, and objectives . However, this strategic plan was designed for the ACCP and not for a hospital-based clinical pharmacy section. In 1998 and under the umbrella of the Pharmaceutical Care Department, Clinical Pharmacy Section (CPS) started with single clinical pharmacist only. In 2011, the new section supervisor, together with his team and the pharmacy administration, developed and implemented a new strategic plan for the clinical pharmacy section. The ACCP strategic plan was relied on as a trustworthy reference with some customization. In this article, we would like to share our experience of applying a strategic plan to the clinical pharmacy section at our institution. Based on the literature review this is the first article that address specific outcomes of strategic plan for institutional clinical pharmacy practice. This article aims to demonstrate the effectiveness of applying a strategic plan and thereby helping pharmacy administration to advance the clinical practice model within their departments. Our internal strengths were; we have a highly motivated clinical pharmacist’s team, most of the members of our team were relatively young yet highly skilled, and the concept of clinical pharmacy was already established since over a decade ago. Our internal weaknesses were; we had a shortage of staff, limited engagement in research, different educational backgrounds (i.e., different practice standards), and we did not have any written strategic plan. Our external strengths were; the role of the clinical pharmacists was known in many clinical departments, most of our doctors were North American trained and understood the role of the clinical pharmacists, the pharmaceutical care services were well established according to North American standards, and we had a pharmacy practice residency program. Our external threats were; the clinical pharmacy services were not established as an essential component of patient care in all practice settings, there was lack of advocacy from some medical departments, we did not gain the deserved ranking in higher administration priorities, and the communication between the CPS and the staff pharmacists was not optimal. Medline search was done to define high standards for clinical practice and to explore other institutions’ experience on this matter. Only a few articles were found; however, the strategic plans reported in these articles were done for the whole pharmaceutical care services, with no clear outcomes for the clinical pharmacy sections. A decision was taken to modify the ACCP strategic plan as a reliable reference based on our needs. The mission of the CPS is to advance human health and quality of life by extending the frontiers of clinical pharmacy. Three strategic initiatives were applied: The first strategy was to provide patient care that optimizes medication therapy and promotes health, wellness, and disease prevention. The second strategy was to advance clinical pharmacy and pharmacotherapy through engagement in research, training, and education. The third strategy was to develop successful models of practice and disseminate new knowledge to advance pharmacotherapy and patient care. The vision of our section is; the CPS will drive positive changes in quality patient care by advancing pharmacotherapy to optimize education therapy in the prevention and treatment of diseases. The following statements were considered descriptors of what selected aspects of the environment in our hospital will look like when the vision is achieved: Other health-care professionals will seek out clinical pharmacists for expert opinion on pharmacotherapyrelated issues, and clinical pharmacists will be leaders in developing innovative models of practice and education. Clinical pharmacists will serve key roles in the development of most guidelines involving pharmacotherapy; health policy and regulatory measures initiated by clinical pharmacists, in collaboration with other health-care professionals, will result in a medication use system that provides exemplary access, efficiency, safety, effectiveness, and economy; and clinical pharmacists will frequently be recognized as principal investigators for important clinical trials and other pharmacotherapy research. They will compete successfully for research funding for the purpose of creating and disseminating new knowledge to guide drug therapy, and formal postgraduate residency training will be required for one to become a clinical pharmacist. All (or the majority of) clinical pharmacists will be board certified by board of pharmacy specialties, and pharmacists will be the primary drug therapy educators of other health-care professionals. Six outcomes were identified for our strategic plan, and they were related to clinical pharmacy services, research, training and education, successful up-to-date practice, advocacy for the clinical pharmacy services, and maximization of patient care and improvement in the pharmacy profession. These outcomes were subcategorized into several strategies, which were also subcategorized into measurable objectives (Table 1). The time frame for achieving these outcomes was five years. Soon after the creation of the strategic plan by the clinical pharmacy supervisor, it was presented in several clinical pharmacy meetings for further review. After a thorough review by the clinical pharmacy team, the strategic plan was approved and recommended to the director of the Pharmaceutical Care Department, who further reviewed it before its final approval. After the approval of the director of the Pharmaceutical Care Department, the strategic plan was signed by all clinical pharmacy members, assistant director, and the pharmacy director. Table 1 summarize the outcomes, strategies, and objective s for the clinical pharmacy strategic plan. The outcomes compliance responsibilities were distributed equally among the clinical pharmacy members in order to ensure clinical pharmacists’ compliance with the strategic plan. Outcome 2: Advances clinical pharmacy and pharmacotherapy through engagement in research. Outcome 3: Advance clinical pharmacy and pharmacotherapy through engagement on training and education. Outcome 5: Maximize the efforts to achieve advocacy from other departments and higher administration. Outcome 6: Work with pharmaceutical care administration to maximize patient care and improve pharmacy profession. Table 1: Achieved Objectives after two years the implementation of strategic plan. After two years of implementation of our strategic plan, we achieved or exceeded more than 70% of our targeted objectives (Figure 1). We achieved 44%, 67%, 78%, and 71% of the objectives for the first, third, fifth, and sixth outcome, respectively. We exceeded the targeted goals for 39% of the objectives. This was especially true for all the objectives in outcome number two and four. Less than one-fourth of the objectives were not achieved (approximately 12%) or were partially achieved (approximately 12%). Forty-four percent (44%) of the objectives in outcome number 1 were achieved or exceeded, while the other 44% were not achieved, and one objective (11%) was partially achieved. For outcome number 3, we achieved or exceeded two-thirds (66%) of the objectives and partially achieved 22% of the objectives. 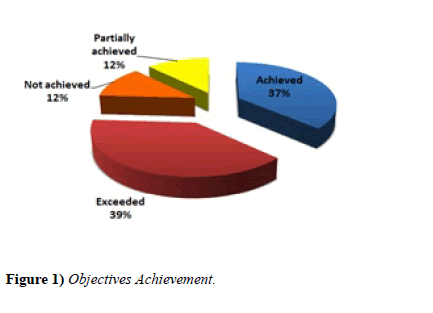 For outcome number 5, 75% of the objectives were achieved or exceeded, and 25% were partially achieved. For outcome number 6, we were able to achieve or exceed only 71% of the objectives (Table 2 and Figure 2). 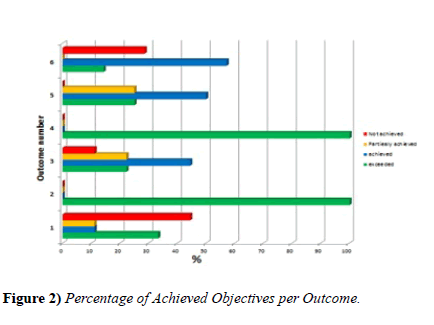 Figure 2) Percentage of Achieved Objectives per Outcome. Table 2: Achieved Objectives after two years the implementation of strategic plan. Strategic planning is the core management activity for all businesses, including health-care organizations and pharmacies. Many articles have been published regarding strategic planning in health-care organizations. Developing a strategic plan for the clinical pharmacy section is the unique character of this article since we were not able to find any specified one in the published literature. After two years of implementing the strategic plan, we achieved most of the outcomes. Within two years of implementing this strategy, we were able to double the number of clinical pharmacists from six to 12 and double the number of board-certified clinical pharmacists from four to eight. Research of clinical pharmacists (as primary authors or coauthors) has dramatically increased to more than 10 within these two years. Among all medical residents’ research projects, the pharmacy resident won first prize for the resident research for two consecutive years. For the first time, the CPS organized a workshop outside the hospital for pharmacists, pharmacy students, and technicians in Saudi Arabia. This workshop had a great impact on disseminating information and knowledge to other pharmacy professionals, plus it had a great impact on the advocacy, not only for the CPS but for the pharmacy department as whole. Seventy percent (70%) of clinical pharmacists have given lectures to medical staff in their area, and some of them have been giving around 10 lectures to medical staff per one calendar year. During these two years, we partially achieved some of the objectives and sometimes were not able to achieve any of them. The failure to achieve some objectives was mainly due to the involvement of a third party or change in the pharmacy department’s workflow system (i.e., the inpatient workflow was changed from decentralized inpatient pharmacy to centralized/decentralized inpatient pharmacy). We were not able to hire any clinical pharmacist with ambulatory care specialty; therefore, we were not able to achieve objective 1.2.1. Because of this, we focused on our current staff training, so our staff took two courses through ACCP and University of Florida (online). Even though we did not use other hospitals’ experiences in this field (i.e., we did not achieve objective 1.2.3), we were able to come up with our own and established an anticoagulation clinic run by clinical pharmacists. Later on, the CPS was expanded to an ambulatory cardiology clinic run by a cardiology clinical pharmacist. We gained the CEO’s approval to buy new software (in order to achieve objective number 1.3.2), which was supposed to help us overcome our shortage in staff and implement a stewardship program, but the owner company (US company) was not able to provide this service overseas at that time. With the expansion of hospital facilities as well as pharmacy services (e.g., expansion of discharge pharmacy counseling and establishment of the medication reconciliation program), we were not able to delegate any clinical pharmacy activities to our pharmacy staff and we were not able to achieve objectives 1.3.3 and 1.3. Due to the introduction of Centralized Physician Order Entry (CPOE) in our institution and the shortage of staff, the pharmacy administration changed the inpatient system to a centralized pharmacy plus three satellite pharmacies in highly dependent units. Because of this, we were not able to achieve objective 6.1.2. The CPS achieved most of the objectives of the strategic plan outcomes. Adopting a strategic plan with higher standards has led to significant improvements in the clinical pharmacy services. Schumock GT, Wong G, Stubbings J. Strategic Planning in Pharmacy Operations. Pharmacy Management. 2012;4:45-61. Pierpaoli PG, Anderson RW. Strategic planning for clinical services panel discussion. Am J Hosp Pharm. 1986;43:2174-7. Linggi A, Pelham LD. Strategic planning for clinical services: St. Joseph Hospital and Health Care Center. Am J Hosp Pharm. 1986;43:2164-8. Kelly WN. Strategic planning for clinical services Hamot Medical Center. Am J Hosp Pharm. 1986;43:2159-63. Anderson RW. Strategic planning for clinical services. Am J Hosp Pharm. 1986;43:2169-73. Guerrero RM, Nickman NA. Strategic planning for patient-specific clinical pharmacy services. Top Hosp Pharm Manage. 1990;9:1-11. American College of Clinical Pharmacy. The Strategic Plan of the American College of Clinical Pharmacy. July 2007.